The areas prevailing wind during the summer months is the infamous Meltemi blowing from the N-NW. It is first felt in June and becomes stronger through July, August and September when it can reach force 8. It dies down in October. In the spring and autumn gales are common from the N and the SE. The summer months are hot, average temperatures are 25 deg C and temperatures often reach 35 deg C.
Milos is the southwesternmost of the Cyclades. A large bay, Ormos Milou, was scooped out when an ancient volcano erupted and hot sulphur springs still exist today. Adhamas is the island's port Go bow or stern to the E side of the ferry pier or bow to the smaller pier to the E. It is also possible to anchor off to the SE of the short pier. The bottom is mud rocks and weed and poor holding in places. There is good shelter from the Meltemi but winds from the south can produce dangerous conditions. There is water on the ferry pier and fuel can be delivered. Most provisions can be obtained in the village and there are some tavernas. Climb the hill to the Chora at Milos for breathtaking views across the bay. There are several other anchorages in the bay that are exposed to the north. There are no facilities at any of them. Apollonia is in the NE of Milos. Go bow or stern to the pier or anchor of the beach. Holding is good on a sandy bottom. There are tavernas and a mini market ashore. Ormos Voudhia lies one mile to the south of Apollonia. There is good shelter from the Meltemi but the surroundings are unattractive with open cast mines and a wharf and ore carrier all in view. Kimilos lies to the NE of Milos. There are two anchorages in Ormos Sikia in the SW of the island. They are exposed to the N - NW and unsuitable when the Meltemi is blowing. Pirgonisi is a long sandy beach on the south coast and yachts can anchor almost anywhere along it in attractive surroundings. Good holding on sand and weed. Psathi lies further along the coast to the east. Go bows to the quay or anchor off. There is little shelter from the Meltemi and yachts are advised to use this anchorage only in calm weather. There are a couple of tavernas ashore and limited provisions can be obtained in the village. Just to the north is Semina Creek and yachts can anchor in the bay. Like Psathi, there is little shelter from the Meltemi and Psathi should be used only in calm weather. The in the NW of island of Poliagos there is a lovely secluded anchorage just to the south of the tiny island of Moanolsi. There is shelter from the Meltemi and good holding on the sandy bottom. On the south side of the island there are several coves that yachts can anchor in when conditions are calm. Folegandros is another barren, rocky island with exception of the small Chora in the NE that lies among green trees and shrubs. The island’s ferry port is Karavostasi. Go bow or stern to the mole on the south side of the arm extending westward. There is poor holding in places on sand and rock. There is reasonable shelter from the Meltemi. There are several tavernas but provisions can be difficult to obtain and the island is totally reliant on deliveries by ferry. On the W side of Folegandros is the large bay, Ormos Vathi. It can only be used in calm weather and there is poor holding in places on sand and weed. Sikinos lies to the E of Folegandros. Ormos Skala is the only harbour on the island. Yachts can go alongside the quay or anchor off. There are tavernas ashore and some provisions can be obtained. The setting is attractive and popular with Greek tourists. 3.5 miles to the east of Sikinos lies Ios. It is claimed Homer is buried here. He died aboard a ship on passage from Samos to Athens and his body was thrown overboard and later washed up on Ios. Go bow or stern to in the harbour of Port Ios. There is excellent holding in mud. A mini tanker can deliver fuel and water is available from a public fountain in the square. There are tavernas all around the harbour and most provisions can be obtained. The resort is popular with the young and most of the bars play loud music in the evenings/night. Ormos Milopotamou lies to the S of Port Ios. In the north of the bay there are 4 coves where yachts can anchor, the easterly two provide the best shelter. Holding is good on sand. There are tavernas and hotels on the beach. Ormos Manganari is a large bay on the south coast of Ios, it is possible to anchor throughout the bay with good holding on sand. There are tavernas ashore. Thira is similar to Milos in as much as it is a volcano and when it erupted in 1440 – 1450 BC it created the bay as it is today. The close lying islands of Thirasia, Nea Kammeni and Palaia Kammeni are also part of this huge volcanic structure. Around the basin, on cliffs 300m high you will see white Cycladic houses with blue painted windows hanging from black volcanic rocks which rise sheer from the sea all group together to make Thira is one of the most popular destinations in Greece. Finikia lies in the N of Thira. 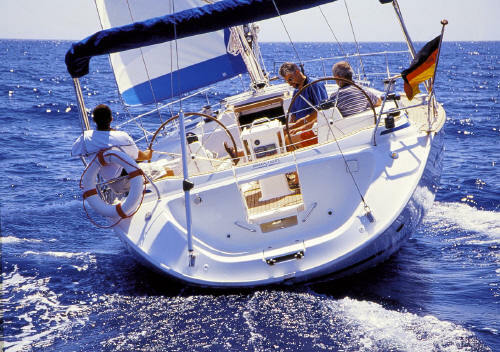 Anchor to the W of the mole in 10 –20m with a trip line because the bottom is rocky. Limited shelter from the Meltemi and completely open to the S. Skala Thira is the harbour of the island’s capital on the steep slopes above. Go bow or stern to the quay with a line to the large mooring buoy. Departing is difficult with the confusion of the many lines attached to the buoy and it is recommended that yachts are not left unattended. There is water on the quay and several tavernas in the harbour. On the coast south of Ak Akrotiri there are a number of anchorages that provide good shelter from the Meltemi. The bottom is good holding in sand but there is often some ground swell that causes yachts to roll badly. Monolithos is a small harbour on the E coast. Go bows to the breakwater near its extremity with a long line. There is a taverna and showers ashore. Thirasia is the westernmost island and the only anchorage is Ayios Nikolaos. Yachts can anchor off but the small pier is reserved for local boats. There are tavernas ashore and some provisions are available in the village atop the cliffs. Nea Kammeni has a number of small inlets where a yacht can anchor. A trip line should be used as the bottom is strewn with rocks that are likely to snag an anchor. Nea Kammeni is known for it’s problem with large rats and there are many reports of the getting aboard yachts. Anafi is the southernmost of the Cyclades. It has one anchorage on the S coast that is exposed. The island is barren and parched and you will not miss a lot if you choose not to visit.